Nowadays many European small and medium-sized companies (SMEs) are not ready for significant required international social and economic changes. Some of them have focused on approaches of knowledge management (KM) as an enabler for their innovation capability, but these have failed. One of the most critical but important aspect to be considered when developing Knowledge Management Strategies in companies to support Process, Organizational and/or Marketing Innovation is an evaluation of KM readiness. The next step after conducting KM readiness assessment is to use the results of the KM readiness for the development of KM approaches supporting the innovation. In this chapter we put forward a method of determining the readiness of SMEs for KM, discuss how to improve links between KM practices and innovation and give examples of methods like the Innovation Biographies (IB). Finally we present knowledge intensive Communities of Practice (CoPs) supported through Web 2.0 as suitable environments to foster innovation within SMEs. Knowledge is the key for all organisations and the success of many of them depends on the effective deployment and continual enhancement of their knowledge base so as to be innovative and to remain/become competitive (Hamburg & Widmaier, 2004). As great challenges loom large for the world economy the need to manage company knowledge becomes more acute. Small and medium-sized enterprises (SMEs) are socially and economically important, since they represent 99% of all enterprises in the EU, provide around 65 million jobs and contribute to entrepreneurship and innovation. But many European SMEs are not ready for significant international social and economic changes (European Comission, 2003; Amtsblatt, 2003; Attwell et al., 2003; Averill & Hall, 2005; Beer et al., 2006). Some have focused on knowledge management (KM) and used it as an enabler for innovation capability, but for many the accepted KM approaches, developed for larger organisations, have failed. It can be very difficult for an SME to manage and sustain business whilst engaging in KM and associated training (Doppler & Lauterburg, 1997). Their priority is survival, leading to just-in-time activities; the benefits of KM to the business have to be very clear and measurable (O´Brien et al., 2008). To be effective and acceptable to staff, knowledge management has to be directly related to activities on the job (Dede, 2005). 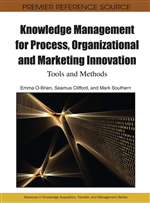 Results of studies, projects and discussions with SME experts and representatives show that one of the most critical but important aspect to be considered when developing Knowledge Management Strategies in companies to support Process, Organizational and/or Marketing Innovation is an evaluation of KM readiness. Many companies lack understanding of their knowledge needs - of what they want to accomplish with a KM effort (Hamburg et al., 2006). They do not know if the organization, the management, the culture, the staff and infrastructures are “ready” for this or not.The aim of conducting KM readiness assessment is to measure the readiness of the company for KM implementation/improvement. If possible, within this evaluation the innovation acceptance/responsiveness of the company should be also checked. The next step is to use the results of the KM readiness for the development of KM approaches supporting the innovation. Say (2006) described how researchers try to develop so-called “third generation” KM approaches that will be focused on enabling the sharing of tacit knowledge. Knowledge intensive, practice-oriented and strong interactive co-operations like Communities of Practice (CoPs) fulfil such requirements. This construct (Wenger et al., 2002) has been used in many different fields including company training. More recently CoPs have been associated with KM and are seen as a way of developing social capital, through sharing existing tacit knowledge by the members (who are the practitioners), so stimulating innovation. CoPs offer new opportunities for KM and learning processes by using new forms of interaction within teams or looser contact networks. They can be considered as innovative tools for a social KM approach. The knowledge that is shared and learned in CoPs is social capital. People connect at different levels and across departments, both internally and externally of the company, without formal constraints. Benefits include problem solving, developing new capabilities, creating knowledge that can be applied for the job, time-saving, leveraging and standardizing practices. It is assumed that CoPs will be an accepted part of organisational development of the companies.